Necromoeba is never going to be the best card in your deck. Sure he beats most things in a fair fight but what sort of sucker fights fairly in constructed. SolForge is full of brass knuckles and knee-to-groin tactics and sadly, Necromoeba just can't hang with the big boys in that respect. What he is though, is the answer to a question, an important and frequently recurring question. When your strongest cards all ask "Do you have a creature in play for me to synergise with?" Necromoeba has you covered like the true friend that he is. 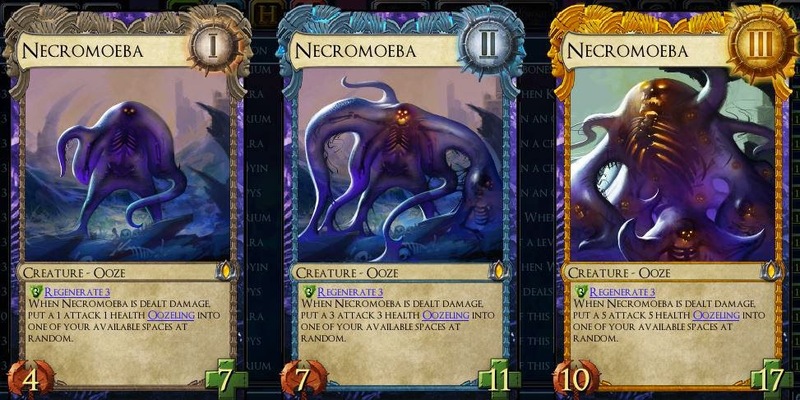 Regardless of the approach we take Necromoeba is going to fairly reliably spit out 1-2 tokens for you to play with. Examining the fair fights in closer detail for a moment, he wins pretty handily against all the 4/6's, and obviously crushes anything with attack less than his regenerate (i.e. broodqueen/tracker/conjurer). Moving up from there he still trades with anything, and anything he trades with generally gives him 2 tokens (windweaver, frostmane, duskmaw, thundersaur etc.). Everflame Phoenix is the only card that truly eats him on its own. The nature of low attack/high health combat though is that its very susceptible to tricks from both sides. This is both a blessing and a curse, while he is a little vulnerable to Duskmaw's Tendrils he also plays very well with them as an ally. Anytime your opponent tries to fight your Necromoeba and gets tricked it ends up meaning a lot more tokens. He also synergises with the build-a-monster cards such as Relic Scout, Dysian Siphon and Lysian Shard. Anytime you can force your opponent to trade evenly with the big ooze man means a lot more little tokens running around than usual. So now that we've figured out how to use our Necromoeba to full value we have to ask, what value exactly are we getting? If all our tokens are doing is scratching opposing creatures for 1 then thats terrible. There are the usual suspects of Ferocious Roar/Lifeblood Dryad/Nexus Aeronaut to try to make them more relevant but I'm not really a big fan of this, other grow wide strategies support them better. Disregarding size for a moment lets look at what else these tokens are doing. They are coming into play, they are occupying a lane, they are scratching opposing creatures and lastly, they are dying. 1. Coming into play - this section is the least useful of the four, the tokens will trigger Tarsus Deathweaver (as do half the creatures in SolForge) and Dryad's Boon is a build-a-monster card that, as we established above, Necromoeba likes but we're stretching it a bit here. 2. Occupying a lane - now we get to start having some fun. By being a creature that exists we can feed any of the upgrade cards, as well as honourary upgrade creature, Nefrax. Brimstone Tyrant in particular has some cool synergy as he will whack the Necromoeba for another token, who will then immediately heal the damage. By occupying lanes we can also foil opposing shenanigans such as Ator/Everflame Mystic/Oratek Explosives where all they want is to see our face. Lastly by filling lanes we control a lot of the random effects in SolForge. Cards such as Nethershriek and Storm Bringer have a lot of potential upside, but to get the most out of them you would love to know which lane they are going to land in, oozelings can provide some level of control (despite admittedly landing in a random lane themselves). 3. Scratch an opposing creature - small amounts of damage work best when combined with each other, this is a core premise of another favourite deck of mine, Stasis. Static Shock, Flamebreak Invoker, Brimstone Tyrant, Epidemic, Firestorm, Uranti Warlord, Lash of Demara and Discordant Strike are all cards that struggle to kill creatures on their own, but when combined together do some serious work. 4. 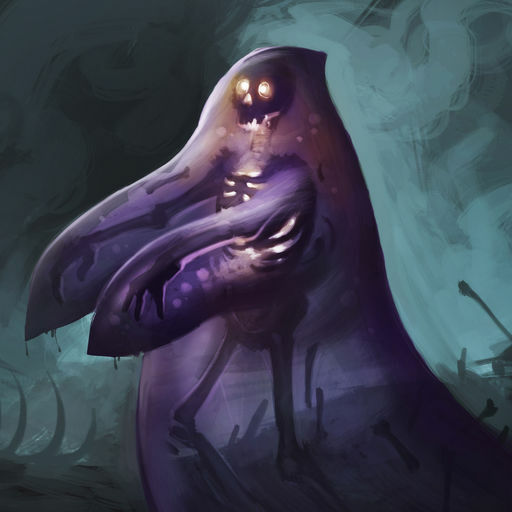 They die - SolForge has a whole species of Grimgaunts that feed off death and flooding the board with random oozelings feeds them all. The Doomrider in particular makes it non-trivial for your opponent to simply kill off your tokens. . I know how much you guys like deck lists so here's an update on a strategy I worked hard on for the February WCQ. In the end I went with N/T but A/N is where it began. As you can see we cover a lot of the points I raised above. We are able to spread wide using Necromoeba, Relic Scout and the Suruzal/Acolyte/Progeny combos and then reward ourselves with Aeronauts and by controlling our Nethershrieks. Our creatures are often on the small side too so we benefit from combining a lot of scratch damage together to take down larger targets. We are also capable of tricking Necromoeba fights with Disco Strike as well as buffing him with Relic Scout. Necromoeba even adds a new dimension in that his tokens can feed Relic Hunter himself, making him occasionally useful and not just added for his Scout. Thanks for reading! and all hail Nekrium as the new grow-wide faction. Editor's Note: David left us the art for the oozeling token, and it. is. ADORABLE! It might eat your flesh, but it's so cute!